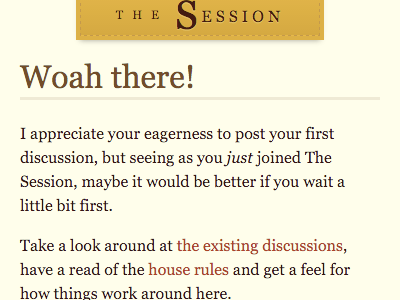 I’ve been using Mailchimp for years now to send out a weekly newsletter from The Session. But I never visit the Mailchimp website. Instead, I use the API to create a campaign each week, and then send it out. I also use the API whenever a member of The Session updates their email preferences (or changes their details). I got an email from Mailchimp that their old API was being deprecated and I’d need to update to their more recent one. The code I was using had been happily running for about seven years, but now I’d have to change it. 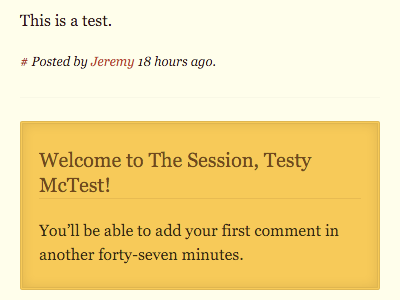 Luckily, Drew has written a really handy Mailchimp API wrapper for PHP, the language that The Session’s codebase is in. Thanks, Drew! I downloaded that wrapper and updated my code accordingly. Everything went pretty smoothly. I was able to create campaigns, send campaigns, add new subscribers, and delete subscribers. But I ran into an issue when I wanted to update someone’s email address (on The Session, you can edit your details at any time, including your email address). That’s somewhat annoying, as the previous version of the API allowed email addresses to be updated, but this workaround isn’t too arduous. Anyway, I figured it share this just in case it was useful for anyone else migrating to the newer API. Okay, that’s a lot more straightforward. Ignore everything I said. 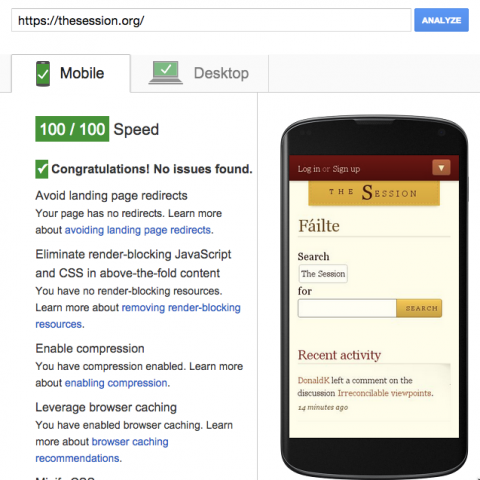 I won’t bore you with the details of this particular feature—which is really only of interest if you play traditional Irish music—but I thought I’d make note of one little bit of progressive enhancement. It’s not the nicest of interfaces, but it works pretty much everywhere. Once I had built that—and the back-end functionality required to make it all work—I could think about how to enhance it. I brought it up at the weekly Clearleft front-end pow-wow (featuring special guest Jack Franklin). I figured that drag’n’drop would be the obvious enhancement, but I didn’t know if there were any “go-to” libraries for implementing it; I haven’t paid much attention to the state of drag’n’drop since the old IE implement was added to HTML5. Nobody had any particular recommendations so I did a bit of searching. I came across Dragula, which looked pretty solid. It’s made by the super-smart Nicolás Bevacqua, who I know shares my feelings about progressive enhancement. To my delight, I was able to get it working within minutes. There’s a little bit of mustard-cutting going on: does the dragula object exist, and does the browser understand querySelector? If so, the select elements are hidden and the drag’n’drop is enabled. Then, whenever an item in the list is dragged and dropped, the corresponding (hidden) select element is updated …so that time I spent making the simpler non-drag’n’drop interface was time well spent: I didn’t need to do anything extra on the server to handle the data from the updated interface. It’s a simple example but it demonstrates that the benefits of starting with the simpler universal interface before upgrading to the smoother experience. Cobh really has become quite the tourist town. Today we—myself, Jessica, and my mother—took a boat over to Spike Island and enjoyed strolling around the fort and taking in the magnificent views. Then we went back across to town and had lunch where the White Star Line office used to be, sitting right next to the pier used to load goods and passengers for the Titanic. We finished the evening in a pub listening to some great tunes (once the bodhrán player got the hint and left). Plenty of sunshine and plenty of pints. A really nice day. Last year at An Event Apart in Seattle I was giving a talk about long-term thinking on the web, using The Session as a case study. As a cheap gimmick, I played a tune on my mandolin during the talk. Chris Coyier was also speaking. He plays mandolin too. Barry—one of the conference attendees—also plays mandolin. So we sat outside, passing my mandolin around. Barry is back this year and he brought his mandolin with him. I showed him an Irish jig. He showed me a bluegrass tune. Together we played a reel that crossed the Atlantic ocean. After listening to Scott rave on about how much of a perceived-performance benefit he got from inlining critical CSS on first load, I thought I’d give it a shot over at The Session. On the chance that this might be useful for others, I figured I’d document what I did. The idea here is that you can give a massive boost to the perceived performance of the first page load on a site by putting the most important CSS in the head of the page. Then you cache the full stylesheet. For subsequent visits you only ever use the external stylesheet. So if you’re squeamish at the thought of munging your CSS into your HTML (and that’s a perfectly reasonable reaction), don’t worry—this is a temporary workaround just for initial visits. Okay. First question: how do you figure out which CSS is critical and which CSS can be deferred? // All my existing Grunt configuration goes here. 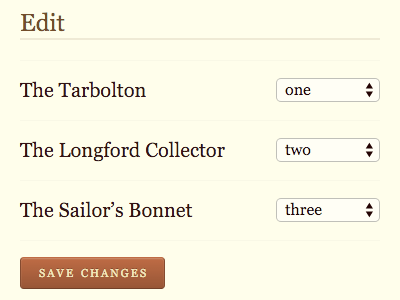 I’m giving it the name of my locally-hosted version of the site and some parameters to judge which CSS to prioritise. Those parameters are viewport width and height. Now, that’s not a perfect way of judging which CSS matters most, but it’ll do. // All my existing Grunt tasks go here. The end result is that I’ve got two CSS files: the full stylesheet (called something like main.css) and a stylesheet that only contains the critical styles (called critical.css). Most of the time it’s a very good thing that browsers cache external CSS files. But if you’ve made a change to that CSS file, then that feature becomes a bug: you need some way of telling the browser that the CSS file has been updated. The simplest way to do this is to change the name of the file so that the browser sees it as a whole new asset to be cached. Right. With that little detour out of the way, let’s get back to the issue of inlining critical CSS. The absence or presence of that cookie is going to be what determines whether the user gets inlined critical CSS (a first-time visitor, or a visitor with an out-of-date cached stylesheet) or whether the user gets a good ol’ fashioned external stylesheet (a repeat visitor with an up-to-date version of the stylesheet in their cache). According to Google’s PageSpeed Insights, I done good. I’ve been updating my collection of design principles lately, adding in some more examples from Android and Windows. Coincidentally, Vasilis unveiled a neat little page that grabs one list of principles at random —just keep refreshing to see more. I also added this list of seven principles of rich web applications to the collection, although they feel a bit more like engineering principles than design principles per se. That said, they’re really, really good. Every single one is rooted in performance and the user’s experience, not developer convenience. Don’t get me wrong: developer convenience is very, very important. Nobody wants to feel like they’re doing unnecessary work. But I feel very strongly that the needs of the end user should trump the needs of the developer in almost all instances (you may feel differently and that’s absolutely fine; we’ll agree to differ). That push and pull between developer convenience and user experience is, I think, most evident in the first principle: server-rendered pages are not optional. Now before you jump to conclusions, the author is not saying that you should never do client-side rendering, but instead points out the very important performance benefits of having the server render the initial page. After that—if the user’s browser cuts the mustard—you can use client-side rendering exclusively. Techniques like PJAX or TurboLinks unfortunately largely miss out on the opportunities described in this section. Ah. See, I’m a big fan of PJAX. It’s essentially the same thing as the Hijax technique I talked about many years ago in Bulletproof Ajax, but with the new addition of HTML5’s History API. It’s a quick’n’dirty way of giving the illusion of a fat client: all the work is actually being done in the server, which sends back chunks of HTML that update the interface. But it’s true that, because of that round-trip to the server, there’s a bit of a delay and so you often end up briefly displaying a loading indicator. I agree …but I also like using PJAX/Hijax. Now how do I reconcile what’s best for the user experience with what’s best for my own developer convenience? Update the page with the new data. In one sense, I am acting immediately to user input, because I always display the loading indicator straight away. But because the loading indicator always appears, no matter how fast or slow the server responds, it sometimes only appears very briefly—just for a flash. In that situation, I wonder if it’s serving any purpose. It might even be doing the opposite to its intended purpose—it draws attention to the fact that there’s a round-trip to the server. Request the new data from the server. If the timer reaches an upper limit, show a loading indicator. I see the new data. …unless the server or the network is taking too long, in which case the loading indicator appears as an interim step. The question is: how long is too long? How long do I wait before showing the loading indicator? You can test the response time by looking at some of the simpler pagination examples on The Session: new recordings or new discussions, for example. To see examples of when the server takes a bit longer to send a response, you can try paginating through search results. These take longer because, frankly, I’m not very good at optimising some of those search queries. There you have it: an interface that—under optimal conditions—reacts to user input instantaneously, but falls back to displaying a loading indicator when conditions are less than ideal. The result is something that feels like a client-side web thang, even though the actual complexity is on the server. Now to see what else I can learn from the rest of those design principles. Most pundits call it “the Internet of Things” but there’s another phrase from Andy Huntington that I first heard from Russell Davies: “the Geocities of Things.” I like that. I now have my own little arduino kit, a bread board and a lucky bag of LEDs. Alas, know next to nothing about basic electronics so I’m really going to have to brush up on this stuff. I never did do any brushing up. But that all changed last week. 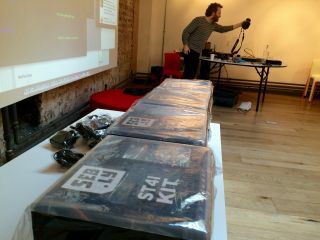 Seb is doing a new two-day workshop. He doesn’t call it Internet Of Things. He doesn’t call it Geocities Of Things. He calls it Stuff That Talks To The Interwebs, or STTTTI, or ST4I. He needed some guinea pigs to test his workshop material on, so Clearleft volunteered as tribute. In short, it was great! And this time, I didn’t stop hacking when I got home. 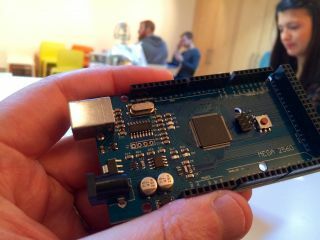 First off, every workshop attendee gets a hand-picked box of goodies to play with and keep: an arduino mega, a wifi shield, sensors, screens, motors, lights, you name it. That’s the hardware side of things. There are also code samples and libraries that Seb has prepared in advance. Now, remember, I lack even the most basic knowledge of electronics, but after two days of fiddling with this stuff, it started to click. On the first workshop day, we all did the same exercises, connected things up, getting them to talk to the internet, that kind of thing. For the second workshop day, Seb encouraged us to think about what we might each like to build. I was quite taken with the ability of the piezo buzzer to play rudimentary music. I started to wonder if there was a way to hook it up to The Session and have it play the latest jigs, reels, and hornpipes that have been submitted to the site in ABC notation. 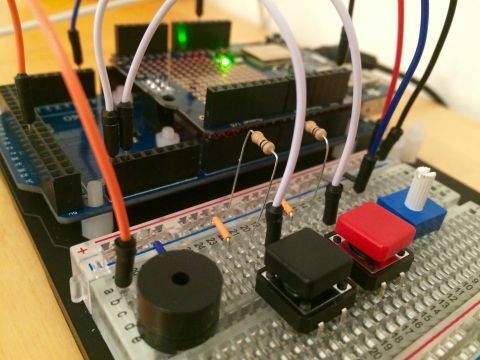 A little bit of googling revealed that someone had already taken a stab at writing an ABC parser for arduino. I didn’t end up using that code, but it convinced me that what I was trying to do wasn’t crazy. 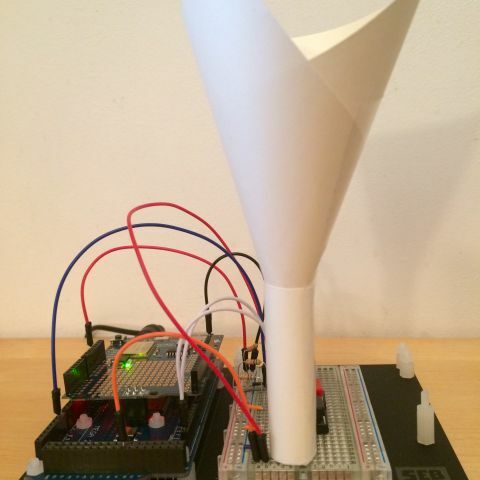 So I built a machine that plays Irish traditional music from the internet. The hardware has a piezo buzzer, an “on” button, an “off” button, a knob for controlling the speed of the tune, and an obligatory LED. The software has a countdown timer that polls a URL every minute or so. The URL is http://tune.adactio.com/. That in turn uses The Session’s read-only API to grab the latest tune activity and then get the ABC notation for whichever tune is at the top of that list. Then it does some cleaning up—removing some of the more advanced ABC stuff—and outputs a single line of notes to be played. I’m fudging things a bit: the device has the range of a tin whistle, and expects tunes to be in the key of D or G, but seeing as that’s at least 90% of Irish traditional music, it’s good enough. Whenever there’s a new tune, it plays it. Or you can hit the satisfying “on” button to manually play back the latest tune (and yes, you can hit the equally satisfying “off” button to stop it). Being able to adjust the playback speed with a twiddly knob turns out to be particularly handy if you decide to learn the tune. I added one more lo-fi modification. 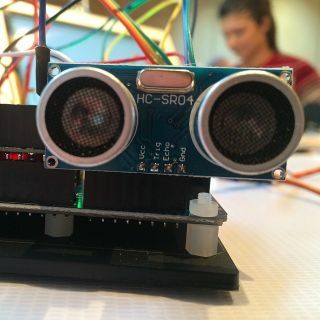 I rolled up a piece of paper and placed it over the piezo buzzer to amplify the sound. It works surprisingly well. It’s loud! I’ll keep tinkering with it. It’s fun. I realise I’m coming to this whole hardware-hacking thing very late, but I get it now: it really does feel similar to that feeling you would get when you first figured out how to make a web page back in the days of Geocities. I’ve built something that’s completely pointless for most people, but has special meaning for me. It’s ugly, and it’s inefficient, but it works. And that’s a great feeling. When I finally unveiled the redesigned and overhauled version of The Session at the end of 2012, it was the culmination of a lot of late nights and weekends. It was also a really great learning experience, one that I subsequently drew on to inform my An Event Apart presentation, The Long Web . ABC notation dates back to the early nineties, a time of very limited bandwidth. Exchanging audio files or even images would have been prohibitively expensive. Having software installed on your machine that could convert ABC into sheet music or audio meant that people could share and exchange tunes through email, BBS, or even the then-fledgling World Wide Web. In today’s world of relatively fast connections, ABC’s usefulness might seemed lessened. But in fact, it’s just as popular as it ever was. People have become used to writing (and even sight-reading) the format, and it has all the resilience that comes with being a text format; easily editable, and human-readable. 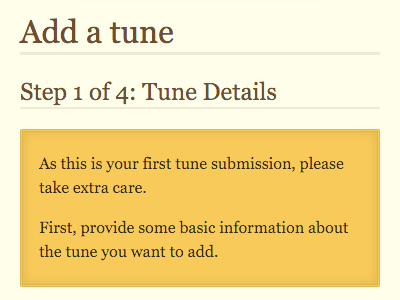 It’s still the format that people use to submit new tune settings to The Session. The Session has a wide range of users, of all ages, from all over the world, from all walks of life, using all sorts of browsers. I do my best to make sure that the site works for just about any kind of user-agent (while still providing plenty of enhancements for the most modern browsers). That includes screen readers. Some active members of The Session happen to be blind. Screen reader users can pause if they didn’t understand a word, and go back to listen to it; they can even have the screen reader read words letter by letter. When reading words letter by letter, JAWS distinguishes between upper case and lower case letters by shouting/emphasizing the upper case letters. But still …I wish there were some way that I could mark up the ABC notation so that a screen reader would know that it should be read letter by letter. I’ve looked into using abbr, but that offers no guarantees: if the string looks like a word, it will still be spoken as a word. It doesn’t look there’s any ARIA settings for this use-case either. So if any accessibility experts out there know of something I’m missing, please let me know. Update: I’ve added an aural CSS declaration of speak: spell-out (thanks to Martijn van der Ven for the tip), although I think the browser support is still pretty non-existent. Any other ideas? A few years back, I was on a road trip in the States with my friend Dan. We drove through Maryland and Virginia to the sites of American Civil War battles—Gettysburg, Antietam. I was reading Tom Standage’s magnificent book The Victorian Internet at the time. When I was done with the book, I passed it on to Dan. He loved it. 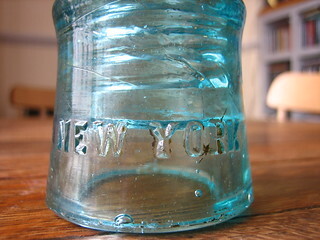 A few years later, he sent me a gift: a glass telegraph insulator. 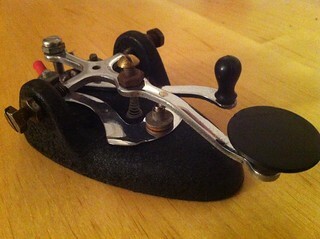 Last week I received another gift from Dan: a telegraph key. It’s lovely. 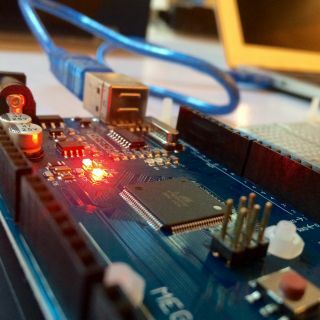 If my knowledge of basic electronics were better, I’d hook it up to an Arduino and tweet with it. Dan came over to the UK for a visit last month. We had a lovely time wandering around Brighton and London together. At one point, we popped into the National Portrait Gallery. 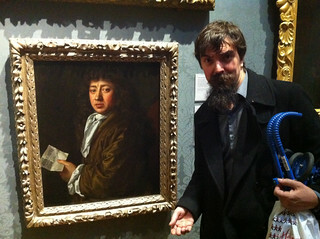 There was one painting he really wanted to see: the portrait of Samuel Pepys. “Were you reading the online Pepys diary?”, I asked. The “guy who did that” is, of course, the brilliant Phil Gyford. Phil came down to Brighton and gave a Skillswap talk all about the ten-year long project. Looking ahead, how will I feel about this Django backend in ten years’ time? I’ve no idea what the state of the platform will be in a decade. I was thinking about switching The Session over to Django, but I decided against it in the end. I figured that the pain involved in trying to retrofit an existing site (as opposed to starting a brand new project) would be too much. So the site is still written in the very uncool LAMP stack: Linux, Apache, MySQL, and PHP. Mind you, Marco Arment makes the point in his Webstock talk that there’s a real value to using tried and tested “boring” technologies. One area where I’ve found myself becoming increasingly wary over time is the use of third-party APIs. I say that with a heavy heart—back at dConstruct 2006 I was talking all about The Joy of API. But Yahoo, Google, Twitter …they’ve all deprecated or backtracked on their offerings to developers. Anyway, this is something that has been on my mind a lot lately: evaluating technologies and services in terms of their long-term benefit instead of just their short-term hit. It’s something that we need to think about more as developers, and it’s certainly something that we need to think about more as users. I don’t know how much individuals and companies habitually think about this. Is it possible to plan for how your online service will work over the next ten years, never mind longer? But I really hope I lose that bet. Maybe I’ll suggest to Matt (my challenger on the bet) that we meet up on February 22nd, 2022 at the Long Now Salon. It doesn’t exist yet. But give it time. It’s a fair question. It also raises another question: how do you define “dealing with” Internet Explorer 8 or 7? You could justifiably argue that IE7 users should upgrade their damn browser. But that same argument doesn’t really hold for IE8 if the user is on Windows XP: IE8 is as high as they can go. Asking users to upgrade their browser is one thing. Asking them to upgrade their operating system feels different. But this is the web and websites do not need to look the same in every browser. Is it acceptable to simply give Internet Explorer 8 the same baseline experience that any other old out-of-date browser would get? In other words, is it even a problem that older versions of Internet Explorer won’t parse media queries? If you’re building in a mobile-first way, they’ll get linearised content with baseline styles applied. That’s the approach that Alex advocates in the Q&A after his excellent closing keynote at Fronteers. That’s what I’m doing here on adactio.com. Users of IE8 get the linearised layout and that’s just fine. One of the advantages of this approach is that you are then freed up to use all sorts of fancy CSS within your media query blocks without having to worry about older versions of IE crapping themselves. The downside to this technique is that now there are two HTTP requests for the CSS …even for users of modern browsers. The alternative is to maintain one stylesheet for modern browsers and a separate stylesheet for older versions of Internet Explorer. That sounds like a maintenance nightmare. Pre-processors to the rescue. Using Sass or LESS you can write your CSS in separate files (e.g. one file for basic styles and another for layout styles) and then use the preprocessor to combine those files in two different ways: one with media queries (for modern browsers) and another without media queries (for older versions of Internet Explorer). Or, if you don’t want to have your media query styles all grouped together, you can use Jake’s excellent method. When I relaunched The Session last month, I initially just gave Internet Explorer 8 and lower the linearised content—the same layout that small-screen browsers would get. For example, the navigation is situated at the bottom of each page and you get to it by clicking an internal link at the top of each page. It all worked fine and nobody complained. But I thought that it was a bit of a shame that users of IE8 and IE7 weren’t getting the same navigation that users of other desktop browsers were getting. So I decided to use a preprocesser (Sass in this case) to spit out an extra stylesheet for IE8 and IE7. IE8 and IE7 will be downloading some styles twice (all the styles within media queries) but in this particular case, that doesn’t amount to too much. Oh, and you’ll notice that I’m not even going to try to let IE6 parse those styles: it would do more harm than good. So I did that (although I don’t really have .scss files named “medium” or “wide”—they’re actually given names like “navigation” or “columns” that more accurately describe what they do). I thought I was doing a good deed for any users of The Session who were still using Internet Explorer 8. But then I read this. It turned out that someone was not only using IE8 on Windows XP, but they had their desktop’s resolution set to 800x600. That’s an entirely reasonable thing to do if your eyesight isn’t great. And, like I said, I can’t really ask him to upgrade his browser because that would mean upgrading the whole operating system. Now there’s a temptation here to dismiss this particular combination of old browser + old OS + narrow resolution as an edge case. It’s probably just one person. But that one person is a prolific contributor to the site. This situation nicely highlights the problem of playing the numbers game: as a percentage, this demographic is tiny. But this isn’t a number. It’s a person. That person matters. The root of the problem lay in my assumption that IE8 or IE7 users would be using desktop or laptop computers with a screen size of at least 1024 pixels. Serves me right for making assumptions. So what could I do? I could remove the conditional comments and the IE-specific stylesheet and go back to just serving the linearised content. Or I could serve up just the medium-width styles to IE8 and IE7. It works …I guess. It’s not optimal but at least users of IE8 and IE7 are no longer just getting the small-screen styles. It’s a hack, and not a particularly clever one. Was it worth it? Is it an improvement? I think this is something to remember when we’re coming up solutions to “dealing with” older versions of Internet Explorer: whether it’s a dumb solution like mine or a clever solution like Jake’s, we shouldn’t have to do this. We shouldn’t have to worry about IE7 just like we don’t have to worry about Netscape 4 or Mosaic or Lynx; we should be free to build according to the principles of progressive enhancement safe in the knowledge that older, less capable browsers won’t get all the bells and whistles, but they will be able to access our content. Instead we’re spending time coming up with hacks and polyfills to deal with one particular family of older, less capable browsers simply because of their disproportionate market share. When we come up with clever hacks and polyfills for dealing with older versions of Internet Explorer, we shouldn’t feel pleased about it. We should feel angry. Update: I’ve written a follow-up post to clarify what I’m talking about here. When I was travelling back from Webstock in New Zealand at the start of this year, I had a brief stopover in Sydney. It coincided with one of John and Maxine’s What Do I Know? events so I did a little stint on five things I learned from the internet. It was a fun evening and I had a chance to chat with many lovely Aussie web geeks. There was this one guy, Christian, that I was chatting with for quite a bit about all sorts of web-related stuff. But I could tell he wasn’t Australian. The Northern Ireland accent was a bit of a giveaway. “You’re not from ‘round these parts, then?” I asked. I started racking my brains. Which geeky gathering could it have been? Freiburg? But that was where I lived in the ’90s, before I was even making websites. I was drawing a complete blank. Then he said his name. With a sudden shift of context, it all fit into place. We had met on the streets of Freiburg when I was a busker. Christian and his companion Kerry were travelling through Europe and they found themselves in Freiburg, also busking. Christian played guitar. Kerry played fiddle. I listened to them playing some great Irish tunes and then got chatting with them. They didn’t have a place to stay so I offered to put them up. We had a good few days of hanging out and playing music together. And now, all these years later, here was Christian …in Sydney, Australia …at a web event! Worlds were colliding. But it was a really great feeling to have that connection between my past and my present; between my life in Germany and my life now; between the world of Irish traditional music and the world of the web. One of the other things that connects those two worlds is The Session. I’ve been running that website for about twelve or thirteen years now. It’s the thing I’m simultaneously most proud of and most ashamed of. I’m proud of it because it has genuinely managed to contribute something back to the tradition: it’s handy resource for trad players around the world. I’m ashamed of it because it has been languishing for so long. It has so much potential and I haven’t been devoting enough time or energy into meeting that potential. I’m not going to make a new year’s resolution—that would just give me another deadline to stress out about—but I’m making a personal commitment to do whatever I can for The Session in 2010. Well, it only took me another two years but I’ve finally done it. I’ve spent a considerable portion of my spare time this year overhauling the site from the ground up, completely refactoring the code, putting together a new mobile-first design, adding much more location-based functionality and generally tilting at my own personal windmills. Trying to rewrite a site that’s been up and running for over a decade is considerably more challenging than creating a new site from scratch. Luckily I had some help. Christian, for example, helped geocode all the sessions and events that had been added to the site over the years. That’s one thing that the worlds of Irish music and the web have in common: people getting together to share and collaborate. Drew and Brian did a superb job with this year’s 24 Ways, the advent calendar for geeks. There were some recurring themes: HTML5 from Yaili, Bruce and myself; CSS3 from Drew, Natalie and Rachel; and workflow from Andy and Meagan. The matter of personal projects was also surprisingly prevalent. Elliot wrote A Pet Project is For Life, Not Just for Christmas and Jina specifically mentioned Huffduffer in her piece, Make Out Like a Bandit . December was the month for praising personal projects: that’s exactly what I was talking about at Refresh Belfast at the start of the month. If you don’t have a personal project on the go, I highly recommend it. It’s a great way of learning new skills and experimenting with new technology. It’s also a good safety valve that can keep you sane when work is getting you down. 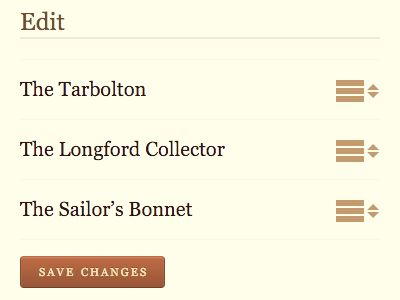 Working on Huffduffer is a lot of fun and I plan to keep iterating on the site whenever I can. 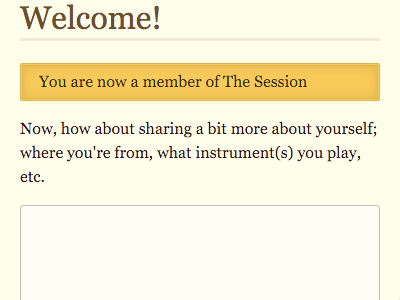 But the project that I’ve really invested my soul into is The Session. Over the past decade, the site has built up a large international community with a comprehensive store of tunes and sessions. Running any community site requires a lot of time and I haven’t always been as hands-on as I could have been with The Session. As a result, the discourse can occasionally spiral downwards into nastiness, prompting me to ask myself, Why do I bother? 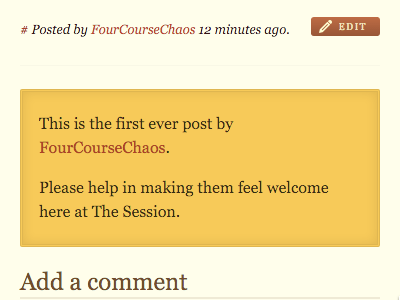 But then when someone contributes something wonderful to the site, I’m reminded of why I started it in the first place. My dedication to the site was crystallised recently by a sad event. A long-time contributor to the site passed away. Looking back over the generosity of his contributions made me realise that The Session isn’t a personal project at all: it’s a community project, and I have a duty to enable the people in the community to connect. I also have a duty to maintain the URLs created by the community (are you listening, Yahoo?). I feel like I’ve been neglecting the site. I could be doing so much more with the collective data, especially around location. The underlying code definitely needs refactoring, and the visual design could certainly do with a refresh (although I think it’s held up pretty well for such a long-running site).